This is an option menu made by me. This option menu can change the windowskin, font, font size, bgm volume, sfx volume, battle bgm, and change bar style and opacity if your using blizzards tons of add script bar script. Change Bar Style if your using blizzards tons of add script with the bar style add on on. Change Bar Opacity if your using blizzards tons of add script with the bar style add on on. Change the Screensize to full screen. # This script is independent so it doesn't modify anything. # -> Change Bar Style if your using blizzards tons of add script. # -> Change Bar Opacity if your using blizzards tons of add script. # -> A preview window for most options. # -> The option help window now works. # -> Added option to remove battle bgm. # -> Added a preview window for most options. # Configurate everything in Juan_Configuration module. return # if an event calls this method the "return" is HIGHLY neccesary! # This window displays options on the menu screen. # This window displays menu function on the menu screen. # This window displays configure option on the menu screen. # This window displays font on the menu screen. # This window displays font size on the menu screen. # This window displays windowskin name on the option screen. # This window displays bgm volume on the option screen. # This window displays sfx volume on the option screen. 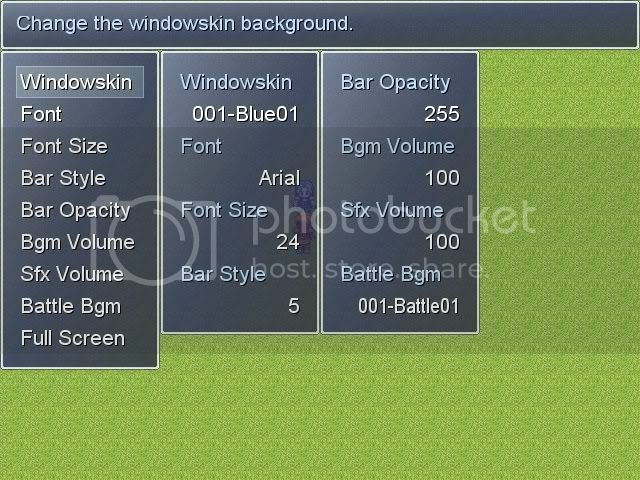 # This window displays battle bgm name on the menu screen. # This window displays bar style on the menu screen. # This window displays bar opacity on the menu screen. # This class performs option menu screen processing. # If battle bgm is forbidden. This script creates windows in other words it doesn't modify anything. Dropbox Who need luck when you can make your own. Blizz's right, you have the Battle BGM changer twice. Thanks. Thats weird I looked through it twice. Althrough I was tired. I'll remove it in a few mins. Edit Fixed battle bgm bug. 1. You might want to add a preview of Bar Style too. 2. Preview of font, if it's not already there. 3. Font size change might not go well universally, I'd personally never keep that option. Yea I might try adding se and bgm volume but I might need help with it. and the preview features I'll look through blizzards script to how he did it. @Fantasist side note this is my first script that isn't based off scene_menu althrough a scene menu add on. I'm still learning to create windows. I tried extracting the bgm and sfx volume change. I don't know if works or not althrough I'll try in a few minutes. Btw thanks for the suggestions. hint: refer to Game_System's methods se_play, bgm_play, etc. I added bgm and sfx volume changer. I'll be waiting for you to update the link. So this is basically a limited Options menu...?? @Reno-s--Joker I'll be updated soon. I'm just making a new layout and one extra feature just a simple full screen options. 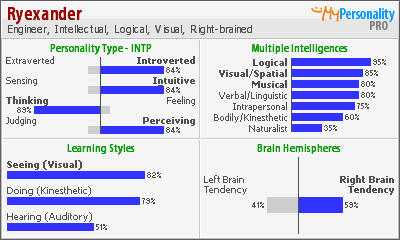 @Calintz16438 I guess. If you use tons it has two extra options. If you have any ideas let me know so I can inplant them. Hey when you update this could you put the script in a spoiler that way the link wont be down. I'll try today. Since I more free time then I did yesterday.